CTBaker in the Acres: Sam the Superstar! In an earlier post I think I begged the infamous question..."What next?" Remind me never to do that again! Last night I was at my Junior League meeting while my boys were across the street with Robin and Billy and playing with Carson. Shannon is away on business. OF COURSE...Is that not how it usually works out???? So I am leaving JL HQ and noticed my 4 missed calls from Robin. I knew something was wrong and I quickly called her. "Not to alarm you", she said,"Sam is okay. 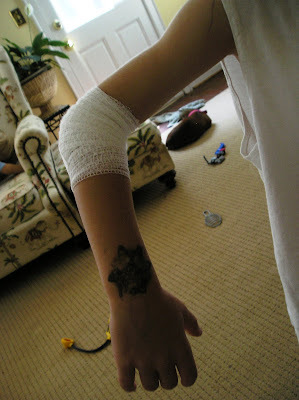 But he has cut his elbow on a window pane." Apparently, He and Carson were playing hide & seek and he chose to hide behind the curtains in the living room. He said he banged on the window with his elbow to give Carson a hint to where he was...well he really gave her a hint and a blood trail to go along with it. She assured me that it had stopped bleeding but I really needed to look at it. I got home and ran across the street to find something I really didn't want to see. It was wide open in a lovely "V" shape. Sam, despite the grotesqueness of his elbow, was poised and completely calm. I called none other than my Mom and Dad (a.k.a. FEMA...help is on the way) to come get Fu and put him to bed while Robin and I went to the ER for stitches. We spent the rest of the LONG evening in the ER and returned home about 12:30 am. He just duked it out like I could have never imagined. Bless his heart! I know it had to hurt. 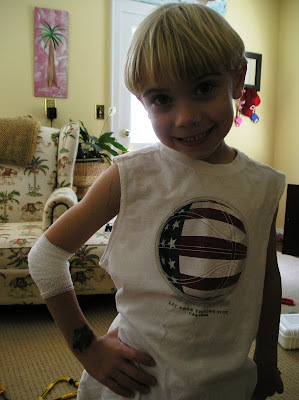 He still has on his war bandages on and is so proud of his bravery. I thought surely that Fulton would have been the first to be stitched up but I was wrong! Sam, You're the best!! !Mommy is too!!! You were both very brave and held up very well. Muzzy however, had her infamous golfcart "events". Thankful we are because God is good! Yikes! That must've been scary for you. But it looks like Sam came through like a champ! I know David's first ER trip will come someday, and I hope we hold up as well.